In September 2016 Tenebrae spent three days in St John’s School, Leatherhead as part of an artistic residency. 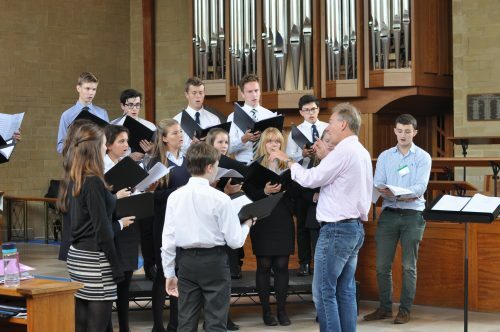 During the course of the residency Nigel and Tenebrae’s Associate Artists worked with the full school choir and the school’s chamber consort, as well as offering Q&A sessions and inviting pupils to observe Tenebrae rehearsals. 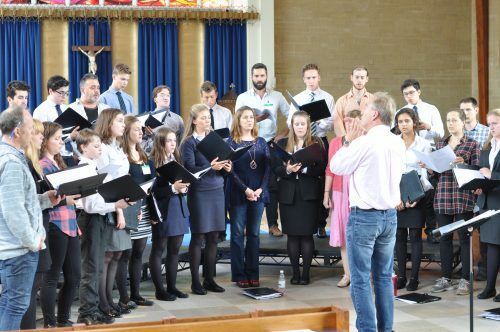 The residency culminated in a performance of Tenebrae’s new part songs programme ‘Music of the Spheres’, in which a group of the student singers joined with Tenebrae to perform a selection of the pieces. Tenebrae and St John’s School, Leatherhead pupils rehearsing for their joint performance. Tenebrae looks forward to returning to St John’s School, Leatherhead for further workshops and concerts in the future.